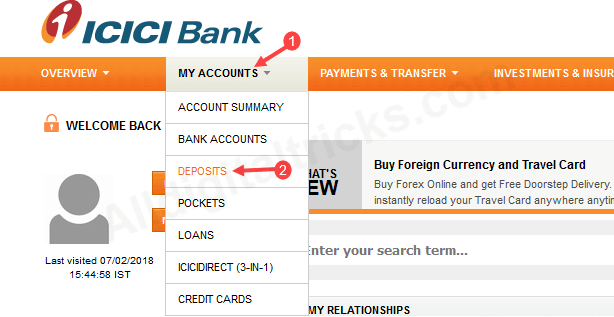 Here we will show you – how to open Fixed Deposit account online in ICICI bank without visiting branch. A fixed deposit (FD) is a saving scheme by banks or post office which provides investors a higher rate of interest than a regular savings account, until the given maturity date. It may or may not require the creation of a separate account. It is known as a term deposit. If you are a ICICI customer and want to invest your money in fixed deposit then you don’t need to visit bank, you can open your fixed deposit account online instantly using net banking facility. 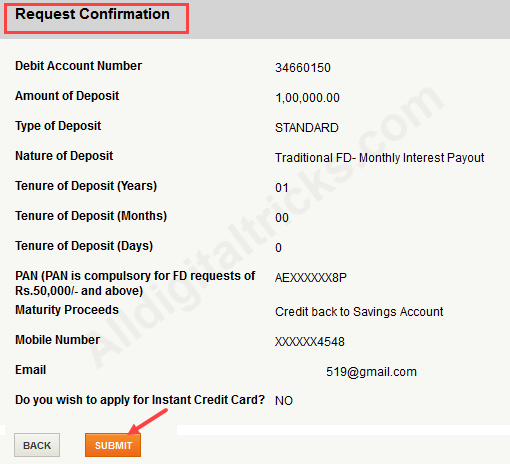 Follow this step by step process and open icici fixed deposit account online. Before you start make sure your pan card is linked with your saving account and also your account is kyc compliant. 1 open icici net banking portal and login. 2 After login, click My Accounts tab and select Deposit option. 3 In next page, click on open now. 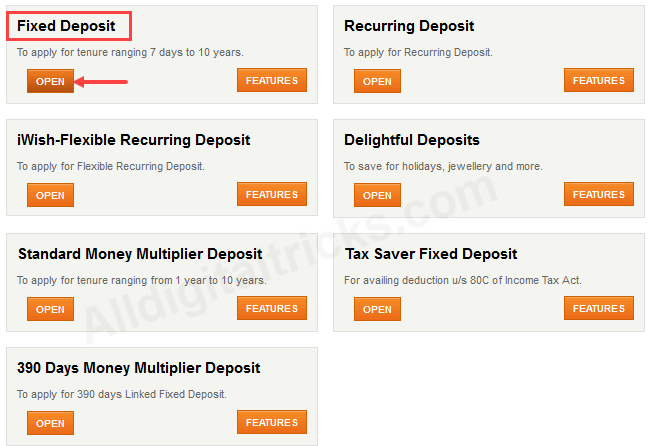 4 Next screen you can see many types of deposit scheme, select Fixed Deposit & click on Open. 5 Now you need to fill out deposit form. Debit Account number – Choose your debit account which used to debit amount for deposit. Type of deposit – select Standard or special. Nature of Deposit – you can select monthly, quarterly interest payout option. Amount of deposit – enter deposit amount. Maturity Proceeds – If you want to renew your fixed deposit then select renew otherwise select credit back to saving account. Do you wish to apply credit card- select NO. 6 In next screen confirm your request. Check your details carefully and click on submit. 7 Done! your ICICI fixed deposit opened successfully. You can see your FD account number. The fixed deposit details and deposit advice will be updated on net banking within 1 working day. To view/download your FD advice, login net banking and click on Account summary. 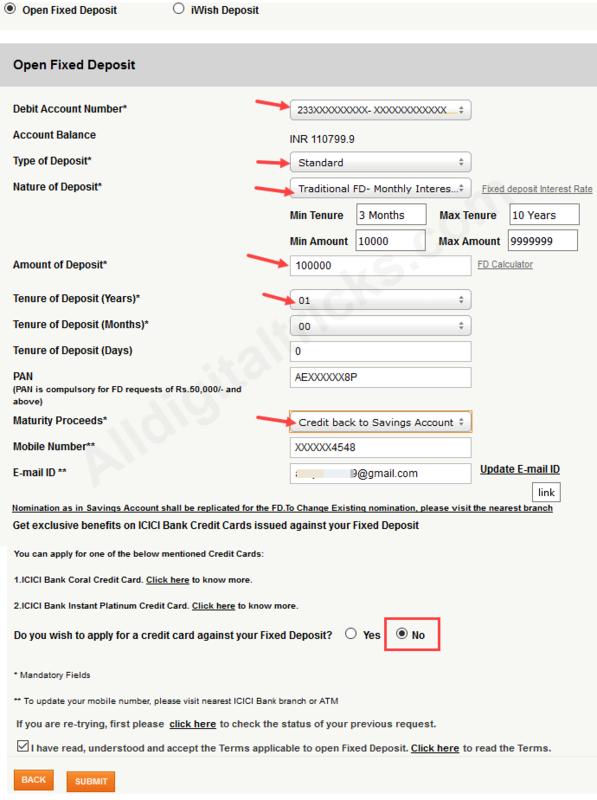 So this how you can open fixed deposit online in ICICI bank through net banking channel. Same you can use iMobile banking to view/open fixed deposit. Im getting GSTInvoice email every month and debit the amount from my account. Is it normal or do i need to take any actions for this? If money debited from your account then please contact icici. I suggest contact them about this gst invoice. I have done a mobile recharge with icici netbanking. But recharge failed and the money debited from my account. How can I get my refund? If its failed, money will be credited to your account. Please wait 48 hours. If not contact icici. My account got debited rs 19 inr for sms charge + GST from icici bank. Is it normal? Note that they charge for january to march. Do they Charge every 3 months? Yes it is normal. Sms charges applied.